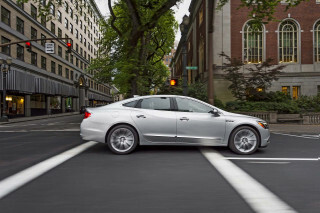 Even if you think you'll want the V-6 model, take the Hybrid for a drive. With a price difference of as little as $1,750 more than the V-6, and smooth, relatively quiet performance that's going to be satisfying for most drivers, this is one Hybrid that's going to pay off quickly with its lower fuel budget. The 2013 Toyota Avalon is more responsive and sophisticated than ever before, without giving up any comfort; and in the new Avalon Hybrid, 40 mpg has never been so serene. The Toyota Avalon may occupy the top run in its lineup, but until now, it's ruled with an invisible grip. The Avalon has lived in the shadows of the best-selling Camry as a longer, plusher, more billowy cousin, quite clearly aimed at an older demographic that craved more relaxed specifications. This year, Toyota is striking out in a new direction, with some reasonable confidence that there's more out there for full-size sedans than relentlessly conservative handling and styling. The new Avalon looks interesting, and feels more lively, and steers into a more compelling direction with a visually dramatic interior and a full dose of high-tech safety equipment. Taking a step back, the exterior of the new Avalon really lures you in; and considering the history of this model, that's saying a lot. 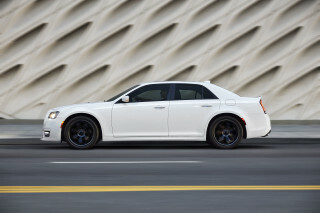 From the side profile, the design looks at ease and neither trying too hard to appear as a hunkered-back rear-wheel-drive sport sedan nor as a cab-forward front-driver. There's a lot to like in the roofline and beltline arcs, and what gives the design punch though is the offset of the rear fender, along with the way the sheetmetal so gracefully flows from the roofline and the doors, meeting in a way that looks not computer-designed but positively hand-sculpted with a series of French curves. Nothing in the new Avalon says farewell to the status quo more than the thoroughly modern instrument-panel layout, and its flush, capacitive (touch-based) dash switches—a feature that cleans up the look, and does away with physical buttons. They sit on a plane closer to the driver, above a layer that's trimmed with wood grain and an attractive striated surface, all framed in metallic trim. It's unique—not Camry knockoff like some previous Avalon interiors. Up close, cabin materials are superb, and also a full league above those in the Camry. The dash and upper door trim are covered in soft-touch material, and the grains actually match throughout the area in the driver's sight. But what's most noteworthy in the 2013 Avalon is how this car drives, and what's under the hood. V-6 models, with a strong, smooth 268-horsepower, 3.5-liter, are still expected to make up most sales; but it's the multiple Avalon Hybrid models in the lineup that seem the most compelling, not only for their surprisingly responsive performance, but for their level of refinement that might even fool some traditional Avalon shoppers. With a net of 200 horsepower, altogether, from its lean Atkinson-cycle four-cylinder, teamed with nickel-metal-hydride batteries and two motors tucked in the transaxle, the Avalon Hybrid can get to 60 mph in just (conservatively) 8.2 seconds. Admittedly, that's 1.5 seconds slower than the V-6, yet the Avalon Hybrid can return a phenomenal 40 mpg city, 39 highway—for a Combined rating of 40 mpg. With the Hybrid weighing only about a hundred pounds more than the V-6, the driving experience isn't far off the stronger model's high water mark. In either case, Toyota has managed to give the Avalon a seemingly awesome performance makeover. It's quicker and more responsive in every way, yet it actually feels far more composed and refined compared to the outgoing model. We wouldn't call it sporty, but it's supremely capable and controllable in a way that the Avalon hasn't been in the past—essentially muting the almost cartoonish queasiness, bounciness, and excessive body motion of the former model. The 2013 Toyota Avalon has shrunk a bit in length, width, and height, but you really wouldn't know it once you climb inside. This is a cabin that feels extremely roomy and far more modern and luxurious than the previous Avalon, with top-notch materials, thoughtful details and comfortable seats. What you get in front are seats that don't have a lot of lateral support, but they're supportive for the back and upholstered in impressive, supple leather, with real stitching—and ventilated premium leather in Limited models. In back, the seats are among the best we've sampled in a larger sedan—contoured well for adults and with relatively long lower cushions to provide thigh support. The new Avalon gets a 16-cubic-foot trunk, and with a flat floor and wide opening, you can fit a lot of grocery bags. Meanwhile, the Hybrid's 14-cubic-foot trunk is only slightly smaller than last year's 14.4-cu-ft cargo hold. The Avalon offers a strong list of safety features, including separate rear side-thorax airbags and front knee bags. And at the top of the lineup there's the Rear Cross Traffic Alert system, which uses sensors in the rear quarter panels to help detect vehicles as they approach from the side and behind the vehicle—especially helpful if you're backing out of a driveway with an obstructed view. Additionally, all but the base Avalon XLE come with a backup camera system. Parsing out the Avalon's pricing and feature set is a little more challenging than in past years. That's because the 2013 Toyota Avalon covers a wider price span, now coming in XLE, XLE Premium, XLE Touring, and XLE Limited trims—with Hybrid models for all but the base XLE. If you want us to distill the line of trims and models down to a single point, it would be this: You're essentially getting a Lexus-caliber feature set—and for the most part, Lexus ambiance—at a price that's at least a few grand less than the Avalon's Lexus ES cousin would be with some comparable features. Much of the lineup gets Entune, capable of running apps (Pandora, for instance) from your smartphone, using your data connection. Top Limited models cost around $40k but are luxury vehicles by the equipment list, with a Blind Spot monitor with Rear Cross Traffic Alert, perforated leather upholstery, heated-and-ventilated front seats, heated rear seats, three-zone automatic climate control, a rear sunshade, 785-watt JBL Audio, HID headlamps, and LED daytime running lamps. Add the Tech Package, with Adaptive Cruise Control, a Pre-Collision System, and Automatic High Beams. Forget about the Avalon looking like an even more conservative take on the Camry; the new 2013 model looks like a stylish luxury car and doesn't disappoint in the details. The Toyota Avalon has never been known for flair or extroversion. 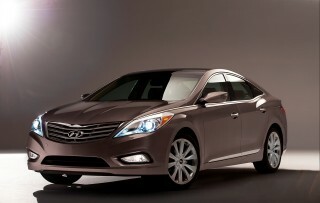 We'd go so far as to call outgoing model one of the most conservative sedan designs on the market inside and out. Yet the new 2013 version takes the Avalon in a new direction that might actually—perhaps for the first time in Avalon history—pull in shoppers based on its styling and design. Toyota calls the new Avalon the most “American” Toyota ever, and that includes this sedan's design. Penned entirely in California, and finished and developed in Michigan, the Avalon was conceived with American tastes in mind—especially an audience in the 40-to-60-year-old range. The design theme of the Avalon is 'Elegant Athletic,' and overall this design is a brisk lane-change—to the degree that it almost warrants a new model name. It's not quite an A7—one of the most beautiful models on the market now to our eyes—but there's no Camry vapor trail left in its lines, and it's truly handsome. Overall, we like how the new Avalon, from the side profile, looks at ease and neither trying too hard to appear as a hunkered-back rear-wheel-drive sport sedan nor as a cab-forward front-driver. We like the way the roofline arc sits above the more subtle arc in the beltline, and the way the rear pillar arc gradually to the back (Toyota tried to keep it as far back as possible without infringing much on either headroom or the trunk opening). In front, there's more of a semblance to the Camry, although the more aggressive lower airdam and squared-off projector lamps, with a 'double-eyed' look, point more to a luxury-car identity. Only in back do we think that the design is a slight bit disappointing, with the somewhat generic lux-sedan taillights putting some droop in the tail. What gives the design punch though is the offset of the rear fender, along with the way the sheetmetal so gracefully flows from the roofline and the doors, meeting in a way that looks not computer-designed but positively hand-sculpted with a series of French curves. The Avalon's dash received special attention from designers; Toyota wanted the new Avalon to have a premium feel and look, and it shows. The cabin's theme is one that's been styled into most of the current generation of Toyotas, but rises above the usual swipe of differently textured plastics. The climate and audio controls sit on a plane closer to the driver, above a layer that's trimmed with wood grain and an attractive striated surface, which itself is stacked over a dash zone framed in metallic trim. It's unique—not Camry knockoff like some previous Avalon interiors. Compared to other big, comfort-oriented sedans, the 2013 Avalon feels quick and responds well—even in Hybrid form. For 2013, Toyota has managed to give the Avalon a seemingly awesome performance makeover. It's quicker and more responsive in every way, yet it actually feels far more composed and refined compared to the outgoing model. In order to get that better responsiveness and control without inviting harshness, engineers borrowed some strategies from the Lexus lineup (especially the latest GS) and added rebound springs within the shocks, increased the spring rate somewhat, and went to a digressive damper valving. Larger stabilizer bars were added in front and in back. What they achieved we wouldn't call sporty, but it's supremely capable and controllable in a way that the Avalon hasn't been in the past—essentially muting the almost cartoonish queasiness, bounciness, and excessive body motion of the former model. V-6 models of the Avalon are still anticipated to be the more popular; they come with Toyota's familiar 3.5-liter V-6, putting out 268 horsepower and 248 pound-feet of torque. 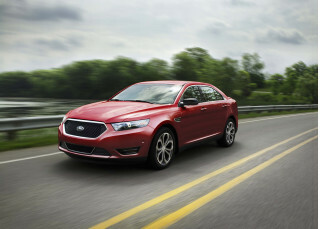 The six-speed automatic adopts a sport-shift mode, and incorporates throttle blipping for smoother gear changes. On Avalon Touring and Limited models, the automatic also gets paddle controls for shifting, and the drivetrain has Eco, Normal, and Sport driving modes that adjust steering, throttle, and shift feel. Zero to 60 mph times takes just 6.7 seconds. On the new Avalon Hybrid, a 2.5-liter four-cylinder runs a lean Atkinson cycle, teamed with nickel-metal hydride batteries and two motors tucked into the transaxle. Gearing continuously variable, through Toyota's tried-and-true planetary power-split setup. A net of 200 horsepower coaxes 0-60 mph times of 8.2 seconds out of the Hybrid four-door, and three driving modes are offered. EV, Eco, and Sport. EV mode allows drivers to run the Avalon on battery power alone up to 25 mph, while Eco mode cuts down on throttle response and HVAC output. Sport mode adapts the Avalon Hybrid's throttle and transmission for quicker response. Those are the details; yet in real-world driving, the Hybrid emerges as the unlikely winner, and in our opinion the best bet. Thanks to a stronger, stiffer, lighter-weight structure, the V-6 Avalon is lighter than before. But with the V-6 Avalon weighing less than 3,500 pounds and the Avalon Hybrid weighing less than 3,600 pounds, there's not as much of a difference in powertrain responsiveness as you might think. Press Sport mode for the Hybrid, and the electric-motor system and quick tip-in give you the confidence to pass quickly or power out of a corner. What's more, we think that the Hybrid feels better-balanced at times in corners near the cornering limit—perhaps because the battery pack in back gives it a better weight distribution. In either model, the Avalon drives like a smaller car than it is, with a precise, natural feel even on curvy, imperfect surfaces. And Sport mode firms up the steering somewhat on V-6 models, or more dramatically in the Hybrid. Disc brakes provide strong stops, with 11.6-inch discs in front and 11.0-inchers in back, but the pedal feel was one of our biggest disappointments on the V-6 in particular; it's spongy and not at all confident or assuring. The 2013 Toyota Avalon has a spacious interior, supportive seats, superb detailing, and futuristic capacitive controls; you may easily mistake this for a Lexus. The 2013 Toyota Avalon has shrunk a bit in length, width, and height, but you really wouldn't know it once you climb inside. This is a cabin that feels extremely roomy and far more modern and luxurious than the previous Avalon, with top-notch materials, thoughtful details, comfortable seats, and futuristic capacitive dash controls. The wheelbase of the new Avalon is identical to the outgoing model, and Toyota has lowered the seating position a bit, yielding more headroom and a more open feeling. What you get in front are seats that don't have a lot of lateral support, but they're supportive for the back and upholstered in impressive, supple leather, with real stitching—and ventilated premium leather in Limited models. In back, the seats are among the best we've sampled in a larger sedan—contoured well for adults and with relatively long lower cushions to provide thigh support. There's not only plenty of legroom but also headroom, and at 6'-6,” I could effectively fit behind another person my same height, with the front seat back all the way. The tallest passengers in back will need to tuck their head a bit when getting in and out, but that seems to be the norm with today's swoopy rooflines. Also of note is that Avalons with the moonroof have a new compact installation that no longer robs so much headroom in front. The Avalon's suspension is a bit firmer, and while there might be a slight bit more road noise entering the cabin than before, new acoustic glass is used for the windshield and side glass, and the windshield wipers tuck inside the cowl for better isolation of wind noise. Between the Hybrid and the V-6, both are quiet during cruising, with no noticeable engine noise; only during hard acceleration does the Hybrid model reveal itself with more coarse engine sounds. Lean in moderately with your right foot when in Sport mode, and you hear the slightest bit of motor whine, too, but it's such a refined experience overall. There's no shortage of smaller storage spaces in the Avalon. Both the front and back doors have storage bins built in, while there are several spaces in the center console, and a leather-lidded bin for smarphone stowage. The keyfob, or other smaller items, fits neatly in a small, hinged, felt-lined bin ahead of the driver's left knee. The new Avalon gets a 16-cubic-foot trunk, and with a flat floor and wide opening, you can fit a lot of grocery bags. Meanwhile, the Hybrid's 14-cubic-foot trunk is only slightly smaller than last year's 14.4-cu-ft cargo hold. No models in the lineup get a capacitive screen, yet all models in the new lineup get capacitive dash switches. And the way that they were implemented is somehow far more intuitive than in many Ford, Lincoln, and Cadillac vehicles over the past couple of model years. Instead of tab that protrudes like a button, below the area you're supposed to press, Toyota frames the button area with a recessed rim. 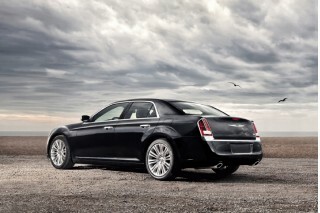 Sound-system volume sliders also work in a more precise, intuitive way than those in GM and Ford models with the same. Up close, cabin materials are superb, and also a full league above those in the Camry. The dash and upper door trim are covered in soft-touch material, and the grains actually match throughout the area in the driver's sight. Otherwise, the Avalon's ride quality is rather non-eventful; there's no longer a lot of body motion, or a super-pillowy, almost queasy ride. Instead it's more of a modern luxury-car ride: firm but not harsh, and just absorbent and yielding enough to completely filter out most bumps and road coarseness. The 2013 Toyota Avalon is shaping up to be one of the safest large sedans on the market, with some very useful active-safety features. In addition to all the expected modern safety features, like electronic stability control, anti-lock brakes with Brake Assist, and a Smart Stop brake-override system—plus ten airbags in all. In particular, driver and front passenger knee bags and rear outboard seat-mounted bags are standard equipment and beyond the typical sedan safety set. Look to the options list for the 2013 Avalon—on top XLE Touring and Limited models—and you'll find several especially innovative features, based on radar systems that are usually reserved for true luxury-brand cars. Of these the true standout is the Rear Cross Traffic Alert system, which uses sensors in the rear quarter panels to help detect vehicles as they approach from the side and behind the vehicle—especially helpful if you're backing out of a driveway with an obstructed view, or out of a tight space in a busy parking structure, for instance. Additionally, all but the base Avalon XLE come with a backup camera system. The available Blind Spot Monitor is tuned to detect vehicles larger than 125-cc motorcycles at speeds over 10 mph, and with a speed differential less than 27 mph, to help reduce false signals, and it warns you with a beep and screen warning. The new Avalon hasn't yet been crash-tested by either of the U.S. agencies, but we do see it as a positive that this model is somewhat structurally related to both the 2013 Toyota Camry and the 2013 Lexus ES 350. Both of those cars have received excellent safety ratings, with both of the models earning the Insurance Institute for Highway Safety (IIHS) Top Safety Pick accolade and the Camry garnering a five-star overall score from the feds. The 2013 Toyota Avalon again has a price that launches well into luxury territory, but you get your money's worth with an impressive, luxury-caliber feature set. Parsing out the Avalon's pricing and feature set is a little more challenging than in past years. That's because instead of just base and Limited models, as last year, the 2013 Toyota Avalon now comes in XLE, XLE Premium, XLE Touring, and XLE Limited trims—with Hybrid models for all but the base XLE. And while the new Avalon starts at a lower price than last year's model, it also runs higher fully loaded. If you want us to distill the line of trims and models down to a single point, it would be this: You're essentially getting a Lexus-caliber feature set—and for the most part, Lexus ambiance—at a price that's at least a few grand less than the Avalon's Lexus ES cousin would be with some comparable features. Overall, Toyota is giving the Avalon a broader focus, over a somewhat younger (40 to 60 year old) crowd that wants more technology for the money but is willing to give up the luxury-brand cachet. At the base end, at $30,990, the Avalon still makes the strong argument on value, but the new strategy instead gives it a price span of more than $10,000 going just by MSRPs, or several thousand more if you go for the Tech Package that adds goodies like Adaptive Cruise Control, a Pre-Collision System, and Automatic High Beams. And with no factory options on the rest of the lineup, that brings the total number of main equipment combinations to eight (five for V-6, three for Hybrid). Base XLE gasoline models include a number of features that have traditionally been optional on luxury models, like power heated (in front) leather seats, a Smart Key system, heated outer mirrors with turn-signal markets. XLE Premium models are a step above that and equivalent to last year's base model in price, and they add a backup camera, a universal garage-door opener, and a moonroof, in addition to other features. The 2013 Avalon XLE Touring prices in at $935 less than last year's top-of-the-line Limited model and adds a Blind Spot monitor with Rear Cross Traffic Alert, 18-inch alloy wheels, and steering-wheel paddle-shifters (gasoline model only). Limited models get perforated leather upholstery, heated-and-ventilated front seats, heated rear seats, three-zone automatic climate control, a rear sunshade, HID headlamps, and LED daytime running lamps. There are essentially three different sound/infotainment systems. XLE and XLE Premium models include a 140-watt touch-screen Display Audio system, while XLE Touring models step up to a 490-watt system with navigation as well as Entune, which allows you to run a series of apps on the touch screen, using the data connection through your paired smartphone. At the top—and only in the Limited—there's a seven-inch higher-resolution screen system and 785-watt JBL premium audio with hard-drive storage. 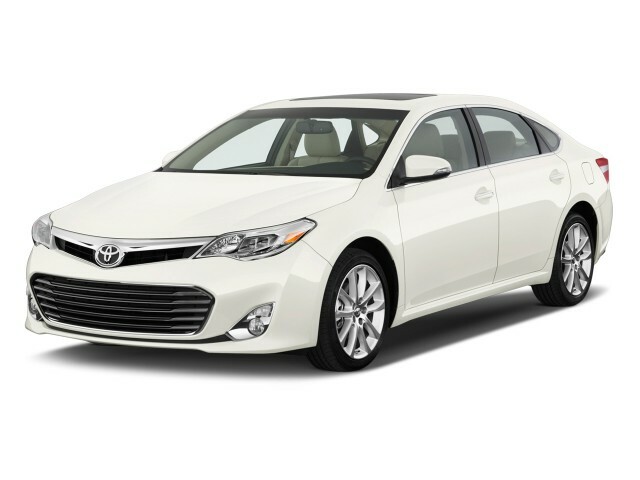 The 2013 Toyota Avalon Hybrid is a big, comfortable five-passenger luxury sedan that gets 40 mpg Combined. Now that's efficiency. The 2013 Toyota Avalon makes incremental improvements in V-6 form, but it's the new Avalon Hybrid that's the star of the lineup. And frankly, a Combined EPA rating of 40 mpg for a big luxurious sedan is very, very impressive. With an EPA rating of 40 mpg city and 39 highway, the new 2013 Avalon Hybrid is one of the most fuel-efficient large sedans in city driving and stop-and-go conditions. What makes it all the more noteworthy is that the Hybrid approaches the same standards of responsiveness and refinement as the V-6 version. And although trunk space is limited slightly by the battery pack for the hybrid system, there are few other compromises. V-6 models of the Avalon get ratings of 21 mpg, 31 highway—still relatively good for such a large sedan. That's better than last year's model, and possible with the Avalon's weight loss and slightly taller gearing for the six-speed automatic transmission. All Hybrid models get a three-button Eco Switch system with normal, Eco, and Sport modes, as well as an EV Mode for covering very short distances with electric power alone. 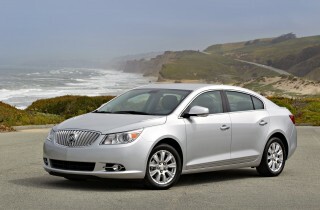 A comparable system is offered in V-6 XLE Touring and Limited models. In either of these versions, Eco Mode yields a smoothed throttle response and more conservative A/C operation, and in the Hybrid it may yield extended EV operation. Toyota notes that the Eco mode isn't figured into EPA ratings, so those who use it might even be able to top those numbers in some conditions. Driving range is impressive, to say the least. The Avalon Hybrid has a 680-mile driving range on a single tank of 87-octane gasoline. One of the best cars on the road and I get 35 mpg or better on a trip. I've had this Avalon, the third, for almost 2 years and it gives exceptional mileage, comfort, and reliability. Is a great road car--comfortable. One downside is the screen is not offset, so when the sun or brightness hits the screen, difficult to read. I see other car brands where the screen is indented so the sun, etc. does not hit the screen. 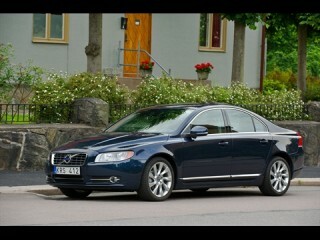 This is a very good car and dependable. Just a little too much road and wind noise. Excellent build and performance at a reasonable cost. In it's segment it is one of the best as per all the pundits and myself.